Litigation Support Analyst Job Description | Fremont College | What Do Litigation Support Analysts Do? The Litigation Support Analyst, or Litigation Support Specialist, is responsible for the day-to-day litigation support needs of assigned cases and projects. The analyst builds, maintains and troubleshoots databases for large, complex litigation in which the documents and data are too vast to sort and analyze manually. A litigation support analyst search, print and organize documents from the database for case team review. Litigation Support Analysts may also assist legal case teams in other case-related support work, as needed. 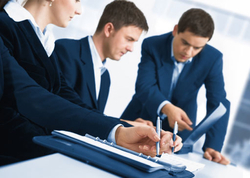 Litigation Support Analysts typically report to a Project Manager or Litigation Support Manager. The Litigation Support Analyst salary varies based on experience. Fremont College offers an ABA-approved Paralegal degree program that takes just 15 months to complete. Receive hands-on training and real-world legal experience that will prepare you for a Litigation Support Analyst career. You will get the chance to conduct actual legal research and participate as a member of an active legal team. Space is limited, so enroll today to prepare for a Law Clerk career.